I wanted to find out if I could screenprint with Jones Tones Plexiglue and then use foil. Well the answer is yes you can screenprint with the glue as long as you work fast and wash out the glue before it can set in the silkscreen. It did very fine detail. See below for screenprint (foiled). 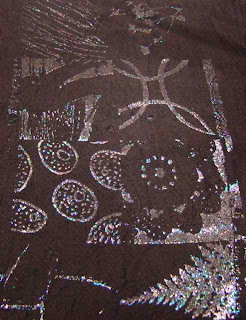 To use Jones Tones glue and foil, you draw, paint, print, squirt it onto the fabric then wait till it dries and then use the sheet of foil and rub it, (shiny side up) over the glue. The next stage is to put one of the samples in the washing machine and wash as normal to see how much comes off in the wash.
Two samples didn't work well, they were both on fine silk. The glue soaked right through and there wasn't enough on the surface for the foil to stick to. 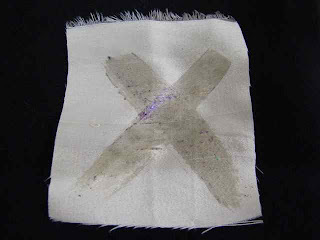 The example above was on cream silk tussore. It didn't seem sticky enough to grab the foil. On the left is crepe silk, again the glue seems to have sunk too far in. 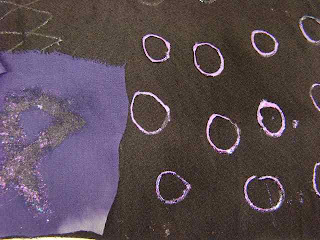 On the right is the glue painted onto thicker silk crepe. The glue is thick and sitting on the surface so the foil stuck to it.